I apologize in advance for not the greatest pictures. 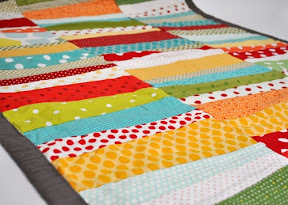 I was trying to figure out a new twist on the old fashioned quilt as you go meets foundation piece project. 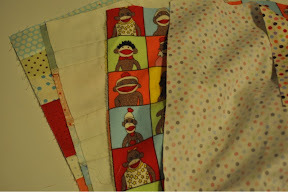 Cut 3 strips of cuddle cloth (Moda’s super soft flannel solids) 13″ x wof. 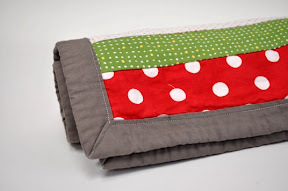 Using your favorite fabrics in a variety of widths, foundation piece strips leaving extra on each edge. 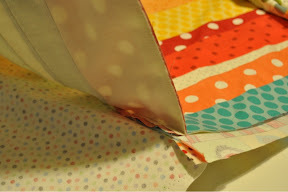 This is good project for scraps, just make sure the strips are about 15″ long so they can be sewn at angles and still cover the width of the flannel foundation.Flip and sew as you work your way up the strip of flannel. 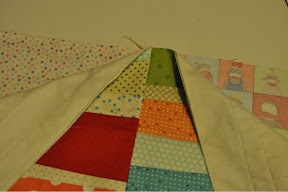 Trim excess fabric a generous 1/4″ away from the flannel as shown in the picture below. Repeat this process for the 3 flannel pieces. Choose backing fabrics. I used 3 different flannels from the funky monkey collections. 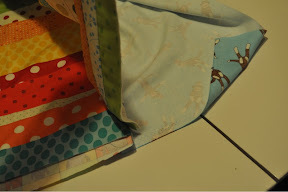 (3/8 yd of each will do it but get 1/2 yd to make sure) Cut backing fabrics 13″ x WOF. This next part is touch to explain and tough to take 3D pictures. Step 1: Lay two stripped pieced sections right sides together. Step 2: Lay two backing fabric right sides together. Step 3: Lay the backing sections to the back side of the dot sections. You will have 6 layers of fabrics stacked together if you count the flannel foundations. Picture below is the four layers stacked up in order. 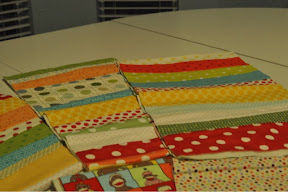 The picture below is after the 2 rows are sewn. 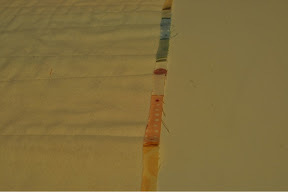 The picture below shows what your quilt will look like when you open the sections that were just sewn. Closeup of what the inner seam looks like. Repeat with row 3 adding it to the center strip. Lay stripped section right side together to center strip. Lay backing fabric right side together to backing fabric. Sew 1/4″ along the edge. 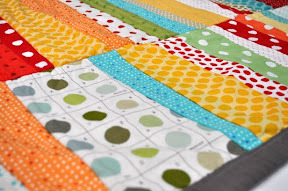 This completes your quilt top and quilting all at once. Press to eliminate bulk. Trim if necessary to square up edges. 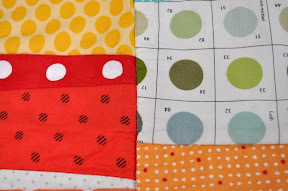 Additional quilting can be added if wanted during this step. Baste around edges and binding accordingly. Stitch in the ditch where the rows are joined for added stability and reducing bulk. I wanted a big chunky binding that would like a border so I did it a little different that a traditional binding. And I actually used the back side of a printed fabric to get the color I wanted. The quilt washed wonderfully using the flannel as the batting and backing. I love it. It is the kind of quilt that can be washed and washed and washed. I think it will get cozier with every wash. 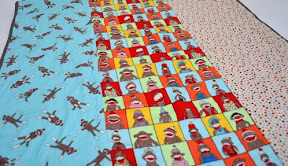 I used that sock monkey fabric for a baby quilt and an apron….love it!!! Love the blankie you made too! This looks like a lot of fun! Love the fabric! !